We couldn’t agree more! One of those highlights is the run out to Straiton with the craggy hills as a backdrop. This route and the roads nearby have long been a favourite training area for cyclists from all over Ayrshire. 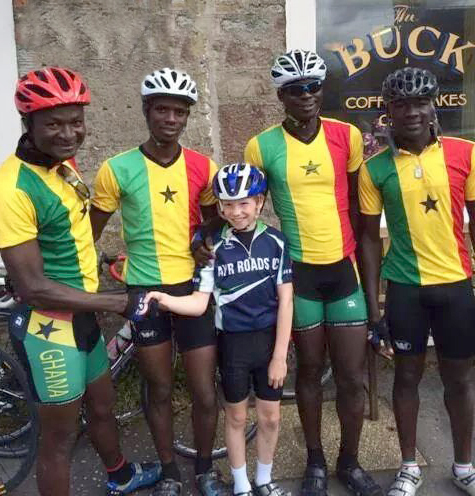 Members from the Ghanian team and Ayr Roads CC members enjoyed refreshments at The Buck – a famous watering hole for cyclists. We hope to see them out training again and wish them all the best for Glasgow 2014. This entry was posted in Uncategorized and tagged Ayr Roads, Commonwealth Games, Cyclists, Glasgow 2014, Team Ghana, The Buck by VisitStraiton. Bookmark the permalink.